Energy consciousness and the future of our planet is now an issue that cannot be ignored by any industry, and the home building industry is no exception. "Unfortunately it’s usually after receiving the keys to their new home that many buyers begin to think about energy efficiency," Longridge Group general manager Andrew Lindsay says. "Solar panels appear on roofs and energy ratings guide the purchase of appliances." He says the best time to make a real contribution to the environment is at the beginning, when you choose your design and builder. By choosing a home built from the latest lightweight composite materials with designs that make the most of the sun, you can make a real difference. The design can play an ongoing role in reducing your reliance on energy costs. Choose a design that optimises light flow but always be aware of the sun’s track in summer. "Twenty-five years of building homes has taught us to take advantage of natural light and warmth to create efficient and friendly spaces to live in," Andrew says. "Meet with your eco-conscious builder onsite to discuss the optimal placement of your home to make the best use of light and plan your garden ahead, including the placement of deciduous trees to provide shade in summer while inviting in warmth and light in winter. "Genuinely environmentally conscious builders now have an array of lightweight construction materials that can be used to add interest to their architecture while reducing the building’s carbon footprint." He says people find homes built with these materials are more interesting contextually, while designs that harness natural light provide a feeling of spaciousness. 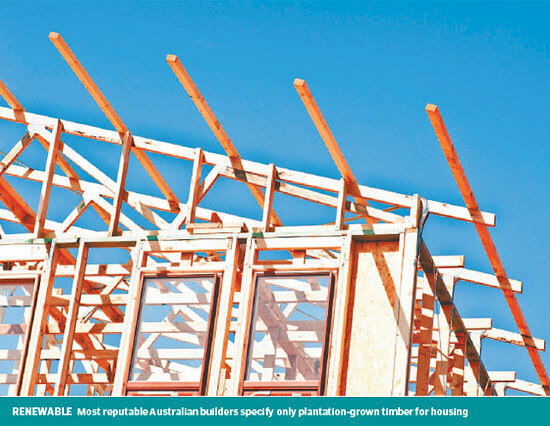 "By using composite construction materials, plantation-grown timber framing and eco-smart design principles, builders can create interesting and eco-friendly homes that offer a blend of liveability and affordability," he says. Materials including glass, hardwood timber, autoclaved aerated panels (Hebel), compressed cement fibre products and steel cladding in a variety of colours and textures provide architects with unlimited design possibilities. Timber has low "embodied energy", about 10-30 per cent of that required to manufacture steel. It is a renewable energy source. While mature trees are felled for construction timber, their replacements absorb carbon dioxide as they grow.